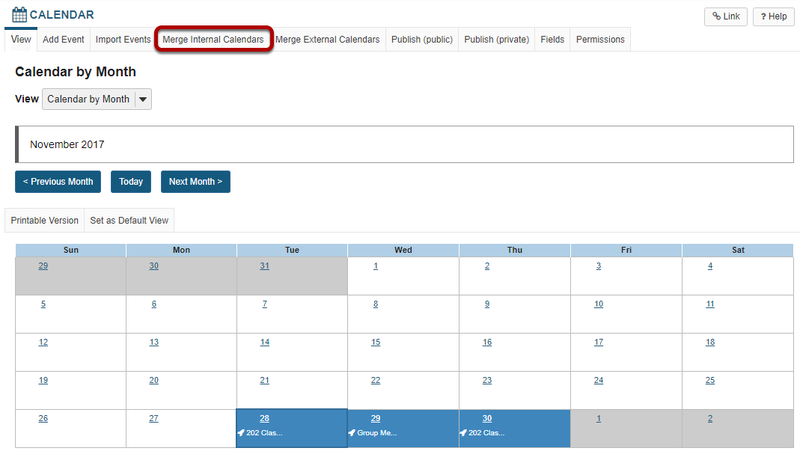 Sakai Guides and DocumentationSakai Complete User Guide CalendarHow do I merge the Calendar with another site? If you would like to combine calendar items from two or more sites, you may choose to merge the calendars. Remember that all calendar entries for sites you have access to are automatically merged in your Home Calendar. Note: You must have appropriate level permissions (i.e. calendar owner) to merge calendars. Merged calendar items will only be visible for site participants who are active in both sites. Zoom: Click Merge Internal Calendars. Select calendars to be merged. Zoom: Select calendars to be merged. In the Show Schedule column, check the box next to any calendars from other sites that you would like to merge with the current site. Prev: How do I print the Calendar? Next: How do I import Calendar entries from a file?